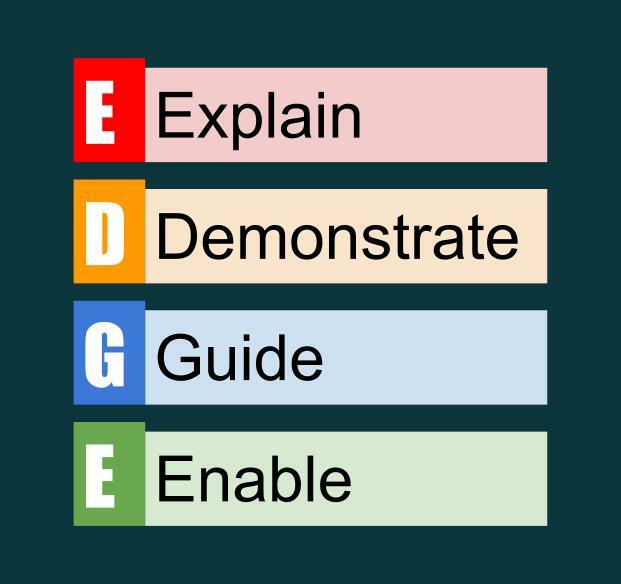 Today, I want to talk about the EDGE teaching method. EDGE gives us a tool that can turn anyone into a teacher. It’s taught during the Boy Scout adult leader training course known as Wood Badge. 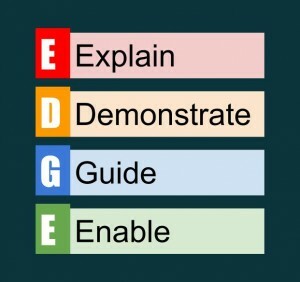 Why is EDGE important? For one thing, without the EDGE Method, SMART Goals would break down and fail. During the Wood Badge course, participants start off in small groups called Patrols. They are lead around by a Patrol Guide – someone who has completed the course and is back as an instructor. Through the two weekends of the course, the Patrol Guide will teach their Patrols using EDGE. By the end of the course the Patrols have taken over the job of teaching as the Guides fade to the sidelines. How is this done so efficiently? The first step in any teaching process is to Explain. “Today, I’m going to show you how to cut paper for match slips so that you retain all your fingers and the scorekeeper is kept happy. The first step is to….” Before you actually do any physical training, the first step is a review of what will be taught. It is best to mix both audio and visual instruction during this step. Mention your teaching goal(s), so that your students have some knowledge of what they are going to learn and have the ability to recognize when they have done so. Don’t focus overly long on your explanation. Personally, I know as an instructor that I have a tendency to spend too much time explaining. Recognize that the real learning won’t happen until we get to the next two steps. That may help you keep this step short; it has for me. Demonstrations are easy if you remember one rule: Everyone learning the process must be able to both see what you are doing and hear what you are saying. Failure to do this will make the next step exponentially harder. Remember to talk to your audience. Don’t just spout noise to fill dead spaces. Make sure to verbally explain what is happening and what you are thinking about as you go through a process. The more complex the process, the more important it is to eliminate extraneous comments from your demonstration. It’s always a good idea to go through the process first at about half speed – then at least one more time at closer to full speed. Be prepared for questions. Stop and answer them as time permits. For very complicated tasks, break them into smaller groups of steps. The more visual you can make this process the better. Pictures are great – actual equipment is better. The more tactile you can make your demonstration, the better it will make an impression. If you have completed the first two steps correctly, this step is easy. Ideally, this is where you hand your students the keys to the Jag and have them drive you to your destination without mishap or verbal direction. In this step, you’re the passenger – watching as they pilot around obstacles and maneuver through traffic. Encouragement is always appreciated. The more complex the task, the more likely it is you’ll need to jump in to explain a point or show them how to perform a step. This is normal. It is better to have this moment to reassert your expectations and make sure your instructions are followed than to have a weird failure some time later with no idea of how it happened. Ah, the big moment has arrived. Whereas before we were a passenger in the car, now we give our students the keys and tell them be safe and have fun. You can offer the gentle reminder that any questions that come up can still be directed our way. We all know how often that happens – so be prepared to follow up to check the student’s pulse after they’ve been on their own for a suitable period of time. Why is EDGE so important? It has to do with how we learn. Seeing or hearing something described? You’ll retain some of the information, but not all of it. Having it demonstrated leads to success most of the time, but inconsistencies can slip in. Even worse, long-term retention for only explaining and demonstrating is rather low. At all times when you are teaching, think of the goal you have for your protege. You want them to not only be able to do this today, you want them to do it five years from now. Guiding people after having talked to them and shown them leads to success. You don’t even have to be a great teacher or public speaker. Following this outline will help you achieve any goal you have that involves teaching people. It’s simple, easy to remember, and adaptable to nearly any situation.